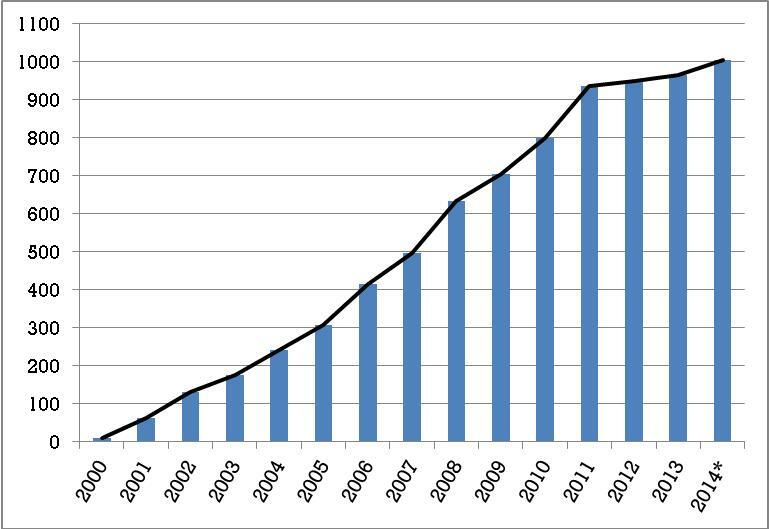 Number of festivals 2000-2014. 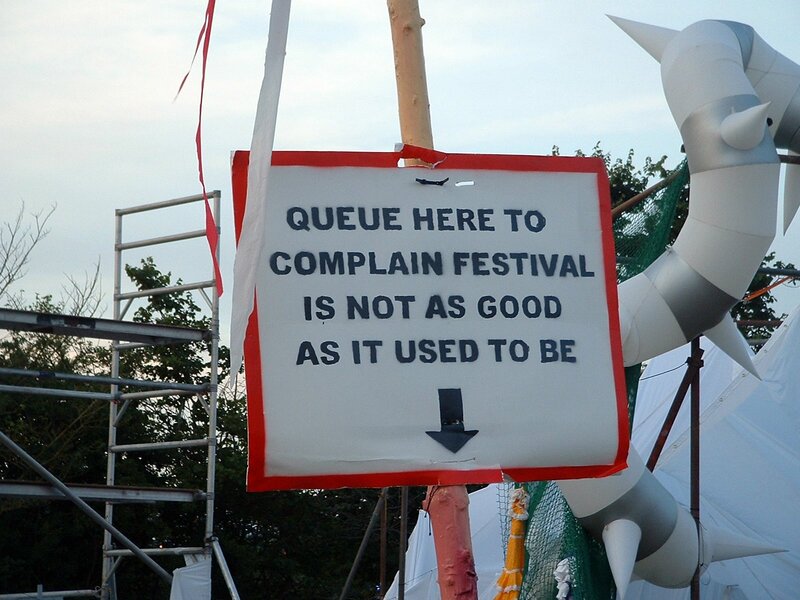 Source: Emma Webster (2014) The Association of Independent Festivals: Six-year report. The popularity of festivals appears to be relatively stable at present, and it is worth highlighting that the UK festival market, via Live Nation and AEG Live, is now integrated into an international corporate live music industry which has become more and more professionalised over the past thirty or so years. In addition, the ‘festival season’ is also now a fixture in the UK’s media landscape, with the BBC providing coverage of major events, most notably Glastonbury and T in the Park. There are signs, however, that the growth of the festival market has slowed down and it appears that the festival sector as a whole is currently on a relatively even keel, albeit with a few high profile casualties in 2012 and 2014. January: Live Nation merges with Ticketmaster to form Live Nation Entertainment, Inc. which is currently the largest entertainment company in the world – Live Nation-Gaiety Holdings is the parent company of Festival Republic, which runs Reading, Leeds and Latitude, and has recently bought the MAMA Group, which owned and/or operated ¶ Lovebox, ¶ The Great Escape, ¶ Wilderness, and ¶ Global Gathering, among others, as well as a 50% shareholding in All Tomorrows Parties (eFestivals). July: Love Parade, Berlin: Twenty-one people are killed and at least five hundred people are injured following a stampede in a tunnel leading to one of the festival sites, after which the organisers decided that the event was permanently cancelled (BBC). Membership of Association of Independent Festivals (AIF): Allez-oop, Bearded Theory, Belladrum, Bestival, Brownstock, Cornbury, Creamfields, Deer Shed, Eden Sessions, End Of The Road, Endorset, Evolution, Field Day, Glade, Glasgowbury, Green Man, Kendal calling, Larmer Tree, LeeFest, Nozstock, Outside Inside, Secret Garden Party, Shambala, SW4, The Beat Herder, Underage, Womad, Y Not. June: Beyonce headlines Glastonbury, becoming the first woman to headline the event in the 21st-century; U2 also headline. July: Bideford Folk Festival Devon, is cancelled due to the economic climate and the rising cost of fuel: ‘Ticket sales have not reached the level where the organisers have confidence that the festival will be financially viable’ (eFestivals). November: PRS for Music is unsuccessful in its attempt to increase the tariff for festival promoters in 2010-2011 (Music Week). Membership of AIF: Allez-Oop (Grassroots), Bearded Theory, Belladrum Tartan Heart, Bestival, Brownstock, Summer Sundae, Cornbury, Creamfields, Deer Shed Festival, End Of The Road, Endorset, Evolution, Field Day, Glade, Glasgowbury, Glastonbudget, Greenman, In The Woods Festival, Kendal Calling, Larmer Tree, Leefest, London Green Fair, Nozstock, Outside Inside, Secret Garden Party, Shambala, Swn Festival, The Beat Herder, The Eden Sessions, The Magic Loungeabout, Tramlines, Underage, Womad, Y Not Festival. 2012 proves to be a very difficult year overall for the festival sector in 2012. Promoters cite a lack of artist availability and scheduling problems with London 2012 Olympics. In addition, 2012 is a record year for rainfall across the UK: Met Office figures for the summer show that it is the second wettest across the UK in the national record that goes back to 1910 and the wettest since 1912 (Met Office). January: The Big Chill (est. 2002) is forced to cancel before tickets go on sale, as a result of external market forces. It has not since returned despite the purchase of the brand in 2009 by Festival Republic when original owners ChillFest Ltd went into voluntary liquidation following poor ticket sales. March: Touring festival Sonisphere, which started in 2009, announces its cancellation in 2012, citing the current economic climate, touring problems, and ‘a bit of bad luck’: ‘Unfortunately circumstances have dictated that we would be unable to run the festival to a standard that both the artists and that Sonisphere’s audience would rightly expect’. Sonisphere returns to the UK in 2014. 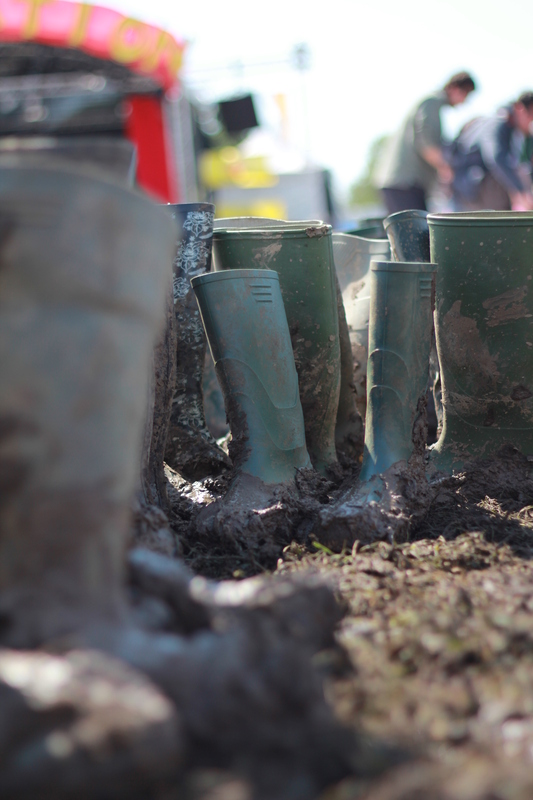 June: Isle of Wight Festival, thousands of rock fans were delayed for hours heading to the Isle of Wight Festival because of torrential rain and very muddy conditions – the promoter, John Giddings, provides tractors to help people get off the site on the Sunday. July: Underage Festival, an event for 13 to 18-year olds is cancelled; the London Olympics force the festival to move venues and mean a lack of availability of appropriate production crew and equipment. It has not returned since. July: Bloc Festival: Following the cancellation of the event mid-way due to overcrowding in parts of the festival site, organisers Baselogic Productions went into administration. Several reasons were cited for the problem, from over allocation of tickets to insufficient account being taken of demand for access to particular parts of the festival. Promoters blamed the festival venue for ‘failures in admission control’ which caused ticketless fans to crash event and cause overcrowding. July: Guilfest suffers a ‘perfect storm’ of contributory factors in 2012 which causes its cancellation in 2013. Competition from major events (including the London 2012 Olympics, and Paul Simon and Bruce Springsteen concerts taking place in Hyde Park over the same weekend), combined with heavy rain, affect the sale of day tickets, and mean that the festival is left with debts of £300,000 and subsequently goes into administration. Guilfest returns in 2014 but has since been declared insolvent, leaving some artists unpaid at the time of writing. August: Creamfields is called off during the event itself in 2012: the two-day event takes place on Saturday but was cancelled on Sunday due to heavy rain which caused flooding in parts of the arena and campsite. Membership of AIF: Bearded Theory, Belladrum Tartan Heart, Bestival, Bingley Music Live, Brecon Jazz, Brownstock, Camp Bestival, Cornbury Music Deer Shed Festival, End Of The Road, Evolution, Festibelly, Field Day, Folk On The Water, Glasgowbury, Glastonbudget, Greenbelt Festival, Greenman, In The Woods Festival, Shambala, Kendal Calling, Larmer Tree, Leefest, London Green Fair, Meltdown, No Direction Home, Nozstock, Outside Inside, Secret Garden Party, Stockton Weekender, Summer Sundae, Swn Festival, The Beat Herder, The Eden Sessions, The Magic Loungeabout, Tramlines, Truck Festival, Underage, Womad, Y Not Festival. January: Lollapalooza Tel Aviv, Israel, is cancelled because promoters could not guarantee that artists would not stay away during the international boycott. June: The Rolling Stones headline Glastonbury. Complaints and debates are commonplace about whether festivals in general (and Glastonbury in particular) have lost a crucial aspect of their initial appeal. Richard Hawley, for instance, refuses to play Glastonbury in 2013: ‘I was offered a lot of money to play and I turned it down because it doesn’t have any meaning. All of the political sides of it seem to have been whitewashed and airbrushed over. The Rolling Stones are playing and that just seems weird to me if you think about what it’s supposed to be and what it’s become’. Billy Bragg, on the other hand, defends the festival, arguing that it was still a valid site for promoting left-wing politics. Again, while Glastonbury has become ‘an institution’, this debate highlights the relative instability of festival’s reputations and of the status of festivals as a whole. October: The ‘Wish You Were Here’ report is published by UK Music; it claims that 6.5million ‘music tourists’ generated £2.2billion for the UK economy while attending UK festivals and concerts in 2012. December: LN-Gaiety partners with V Festival. Membership of AIF: 2000 Trees, Arctangent, Belladrum Tartan Heart, Bestival, Blissfields, Bournemouth 7s, Brecon Jazz, Brownstock, Cornbury Music, Deer Shed Festival, End Of The Road, Evolution, Festibelly, Folk On The Water, Glastonbudget, Greenbelt Festival, Heb Celt Fest, In The Woods Festival, Kendal Calling, Larmer Tree, Leefest, London Remixed, Nozstock, Open House Festival, Outside Inside, Rhythm & Vines, Secret Garden Party, Shambala, Stockton Weekender, Swn Festival, The Beat Herder, The Eden Sessions, Tramlines, Village Green, Wakestock, We Are Fstvl, Y Not Festival. March: The Mendip Council grants Glastonbury Festival a ten year licence in 2014 following a tumultuous number of years. May: A YouGov report suggests that 28% of surveyed festival-goers believe that festivals have become too corporate, 14% say that there are now too many festivals with the same acts doing the rounds, and 11% say they are becoming bored with festivals. James McCoy, Research Director at YouGov, commented on the research: ‘The report shows that while demand for music festivals has remained high, it will be interesting to see which events survive pressure on disposable income as the market becomes increasingly saturated. The challenge for festival organisers is to act upon the grievances of festival goers, in order to provide an experience that is value for money, enjoyable and likely to result in return visits’. June: Glastonbury provides attendees with 4G wi-fi hotspots via its ‘Highspeed Herd’, fibre-glass cows which are, in fact, wi-fi transmitters. Glastonbury’s Michael Eavis announces that his last Glastonbury will be 2020, when he is 85; it seems likely that his daughter Emily will take over. July: I Am Music Festival, which was expected to attract up to 8,500 people, is cancelled two days before the event because the local council withdrew permission, citing concerns over safety and security. July: Sonisphere returns to the UK; Iron Maiden and Metallica headline. Sonisphere 2015 in the UK is cancelled. July: Guilfest returns but has since been declared insolvent, leaving some artists unpaid at the time of writing (CMU). August: Alt-Fest cancels two weeks before the event; organisers blame low ticket sales, the last minute departure of an investor, a “costing error” and high costs of putting on the event. 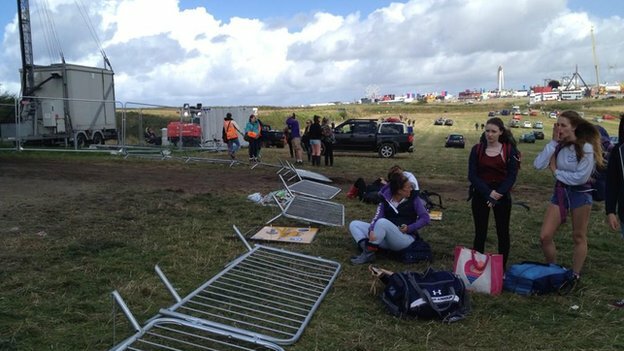 August: Boardmasters’ final day has to be cancelled due to extreme weather conditions caused by Hurricane Bertha. August: Festival No. 6 provides a three-course banquet cooked by top chefs for an extra cost as many festivals diversify their offer. August: Bestival director Rob da Bank announces a distribution deal which will see the introduction of a US counterpart for the festival, and into other countries across Europe as well. Reflecting the general shift from ‘glorious amateurism’ to a more business-minded practicality across the live music sector, da Bank stated that ‘The deal has been a long time coming. I’ve never been in this industry for the money but now I’m 40 with three small kids, it’s time to get business minded. We’ve made a real impression on the festival market and pioneered a lot of ideas. People think Bestival pours multi-millions into my bank account every year and it doesn’t… that’s not a sob story but now it’s time to knuckle down a bit. My twenties and thirties were a total laugh but now I have to be responsible’. September: A somewhat alarmist article entitled ‘Festivals in crisis’ in the NME describes 2014 as a ‘summer of cancellations’ (Hebblethwaite, Phil (2014) Festival Fallout. New Musical Express, 6 September, p. 40). The article lists the following festivals as having cancelled or otherwise in 2014: The Hub, Third Rail, Essexfest, I Am Music, Boardmasters, Another World, ATP’s Jabberwocky, Alt-Fest, Surround, Mas Mas, Homegrown; the following are listed as ‘never got started’: Oxegen and Rockness; and Camden Crawl is listed as ‘liquidated’ (Ibid., p. 39). October: At the first AIF Festival Congress, a report by Emma Webster to mark the AIF’s sixth birthday shows that the spend by AIF member festival-goers for the past five years (2010 to 2014) is estimated to be approximately £1.01 billion. October: Glastonbury 2015 sells out in record time taking just 25 minutes to sell 120,000 tickets (on top of 15,000 already sold). April: Live Nation takes a controlling stake in American festival Bonnaroo; the music industry website Complete Music Unlimited cheekily described Live Nation as, ‘Continuing in its bid to own every festival not only in the world but also in history’. As well as festivals, Live Nation is also now very heavily intertwined with the EDM market, particularly in the States. June: Florence and the Machine becomes the first British woman to headline the festival in the 21st-century. Festivals in general are criticised for male-heavy line-ups. July: Gloucester’s Three Choirs Festival, potentially the oldest festival in the world, celebrates its 300th anniversary; part of the celebrations include a performance in the Ballroom of Buckingham Palace, in the presence of HRH The Prince of Wales.